Feb 6, 2019: The U.S. Food and Drug Administration (FDA) has approved Cablivi® (caplacizumab-yhdp) in combination with plasma exchange and immunosuppression for the treatment of acquired thrombotic thrombocytopenic purpura (aTTP) in adults. Cablivi is the first FDA approved therapy specifically indicated for the treatment of aTTP. Full press release here. 2018 International TTP Day participant fundraising directly impacts the Foundation's ability to provide ground breaking research funding. The Ohio State University TTP/aHUS face-to-face meeting was made available to non-local participants to join virtually. On Wednesday November 7th, Dr. Cataland presented a great layman explanation about the role of the ADAMTS13 enzyme in TTP. In addition, he thoughtfully answered questions from both the face-to-face and virtual audiences about TTP triggers, treatments, side effects and more. On an exciting note, he explained the role of a new drug called caplacizumab. The European Commission has granted marketing authorization for caplacizumab for the treatment of adults experiencing an episode of aTTP on August 31, 2018. Answering TTP Foundation provided research grant funding to support Dr. Long Zheng which has resulted in two research papers on TTP. Together we are furthering the understanding and coming closer to a targeted treatment for TTP. Congratulations Dr. Long Zheng! And congratulations to all supporters of the Answering TTP Foundation. A healthcare research firm is recruiting patients who have been diagnosed with hereditary (inherited) thrombotic thrombocytopenic purpura (hTTP). hTTP represents about 1% of TTP cases and is characterized by inherited deficiency or abnormality of the ADAMTS 13 enzyme. For more information and for participation instructions click here. The 9th Annual Chance for Change raised $200,000 on April 21, 2018. Guests were thrilled by our new venue, our wide selection of silent auction items, the fun games, exciting raffles, stunning entertainment and delicious food. The Answering TTP Foundation's Board of Directors has received impact statements from two Principal Investigators that have completed their Foundation funded grants. The results are encouraging. A patient-led organization plays a vital role in the quest to conquer TTP. Congratulations to our researchers and to all those who support the Foundation. Kelly Ketcham passed from TTP one year ago. Kelly had three young, beautiful girls. She left behind loving family and friends that miss her more than words can say. 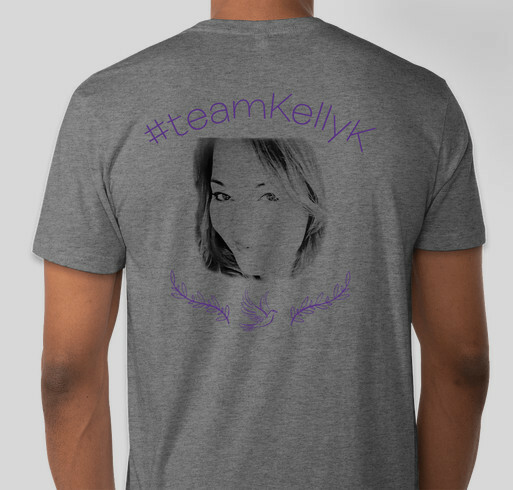 Her family is organizing this t-shirt fundraiser in Kelly's honour to benefit Answering TTP Foundation. Our heartfelt condolences to the family of the late Max Marin who died 10 days after being diagnosed with TTP. Max lived in Calgary, Alberta. He was a 45-year-old father, husband and well-known MMA trainer. Reports indicate that the TTP diagnosis was missed by the health clinic he visited initially. Only when his health deteriorated, and his family took him to the main hospital, was he diagnosed with TTP. "I didn’t realize, or should say I didn’t want to admit to myself, that TTP had impacted my life until a few years later."